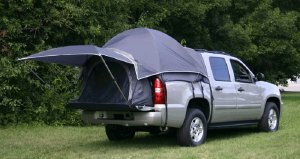 Napier Enterprises is proud to launch a new truck tent designed specifically for the rugged, all terrain Chevy Avalanche. The Sportz Truck Tent III for Avalanche’s was designed specifically to compliment the unique design features of the Avalanche. Clean, dry rest on our patented sewn in floor. Doorway leading into cab for access into interior of the truck. Two plastic windows on both side of the tent to allow the use of bed cargo lights. Color-coded poles for easy set-up. Included a full size, seam sealed rain fly with 6X6 awning. Two large no-see-um-mesh windows for ventilation. Shock-corded, carbon fiber glass poles. Lightweight yet durable nylon floor.